Kelsey Reed has founded her own brand of Yoga, Innercise Yoga– its cleansing, upbeat and powerful AF! She is such a positive strong voice. Every time I take her class, her energetic messages stay with me well after! ‘Expanded conscious’ is in her motives. 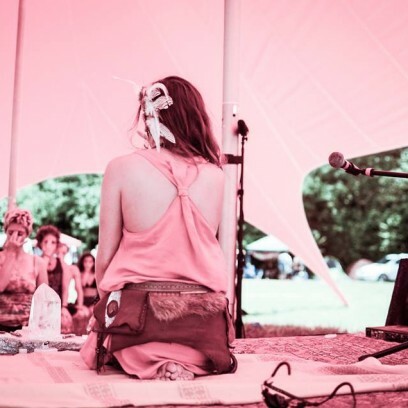 She not only has serendipitously paved a way for gathering yogis at cool events, but also continues to rise above her own hardships and critics in order to make these events happen in a modern way. She combinines American culture with the practice of Yoga making this ancient practice even more accessible and appealing than a studio. Also on deck, she brings music, aromatherapy, massage therapy, Innercise tees/tanks, essential oils and great post practice class mingling! As a woman sole proprietor, she is truly an inspiration to anyone trying to start their own business in a creative and unique way! Rally on​! I love having you as a teacher. You create the right balance of like mild death that becomes zen 10/10! I have had the pleasure of taking yoga classes with Kelsey Reed. She is very knowledgable and demonstrates the wisdom of her experience through each moment of instruction. I would describe her classes as I would describe her: unassumingly playful, intuitive, and invigorating! From the moment I talked with Kelsey over the phone asking questions about this new Atmasphere concept opening up in Buckhead, I could tell Kelsey really cared about me and my experience with yoga. She made me feel important and that I mattered and my experience with yoga is wonderful, no matter where I was at in my journey. I began to go to her events and practice yoga with her. Her teaching style really comes from her heart and she is a natural! I always feel safe and supported, it’s raw, it’s light-hearted, it’s challenging, it’s informative, and it’s exactly what my body and mind need…every time. Kelsey’s love and passion for yoga is so inspiring that it makes me want to strive for that in my life as well. Whether or not it’s yoga for me, it really pushes me to find that type of passion in my life. She’s a natural teacher and doesn’t even realize that she’s teaching more than just yoga and movements…she’s teaching ways to be a better version of ourselves. Kelsey Reed is truly a gem. She has a seemingly effortless way of guiding her students, through not only yoga poses, but the spaces in-between as well. Her sincerity and extensive knowledge of yoga is paralleled with her ability to tune into her students, of all levels. She truly lights up any room and consistently surpasses my expectations, with each class that I attend! I highly recommend experiencing Kelsey Reed’s classes, her one-on-one sessions and yoga retreats. They are truly priceless! Kelsey Reed embodies the sweet and strong spirit of someone who has found herself through yoga and believes in the practice. She speaks with a calm assurance and clarity, guiding her students through breath work and asanas that allow for more space within the body, and utilizing props to facilitate deeper movement and relaxation. What I loved most were her loving reminders, honesty, and occasional giggles! Kelsey Reed has a true gift for teaching yoga and meditation. She is able to gently uplift her students in a very nourishing and authentic way. Her ability to consciously hold space for others to heal themselves is something that can not be taught. She is a blessing to the community she serves.